August 15, 2012 - Federal Aviation Administration (FAA) pilots have completed all the scheduled flying required for the certification program for Gulfstream’s ultra large cabin, ultra long range Gulfstream G650. In addition, the European Aviation Safety Agency test team finished the flight testing required for its validation of the FAA’s type certification. The G650 received a provisional type certificate from the FAA on Nov. 18, 2011, and is in the process of completing the final certification tests with the FAA to support entry into service later this year. As of July, the test fleet had flown more than 3,800 hours during more than 1,160 flights. The final certification tests included completing the field performance tests, evaluating the aircraft’s performance in natural icing conditions and conducting function and reliability testing. The aircraft already has set two city-pair speed records. It flew from Burbank, Calif., to Savannah in just 3 hours and 26 minutes. The aircraft accomplished this at speeds between Mach 0.91 and 0.92, with a brief segment at the aircraft’s maximum operating Mach number of 0.925. Its average ground speed was more than 550 knots. Its maximum ground speed en route was more than 660 knots. The second city-pair record came when the aircraft made its first trans-Atlantic crossing, flying from Washington, D.C., to Geneva at speeds from Mach 0.90 to Mach 0.92. The aircraft made the journey in 6 hours and 55 minutes. The Gulfstream G650 is a twin-engine business jet aircraft under development which began in 2005 and revealed it to the public in 2008. 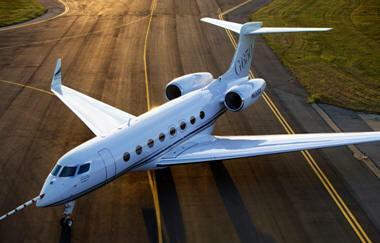 The G650 is the company's largest and fastest business jet. The G650 has a cruise speed of Mach 0.85 to 0.90, with maximum speed of Mach 0.925 and will have a range of up to 7,000 nmi. It will be equipped with a full kitchen and bar and may be equipped with a variety o1f entertainment features including satellite phones and wireless Internet. The new jet will use the new Rolls-Royce BR725 engine producing a maximum thrust of 17,000 pounds-force. Gulfstream states that with a weight of less than 100,000 pounds, it will be able to land at small airports avoiding the busy airports around the world.